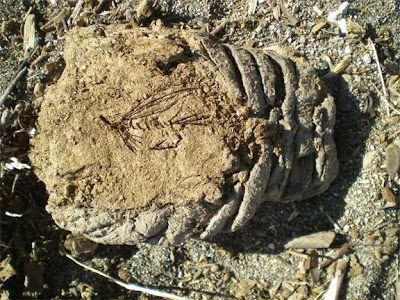 .. Immortalized in Bison Poo is a beautiful rendition of Yellowstone's favorite fly: the "CRUSTY CRITTER." Traveling artist Jeff Kennedy has returned home from his splendid Yellowstone Adventure and the flow of fly offerings is back. .. Click on over to Drawing Flies 365 and check out the progress - we're holding our breath. The Sand Fly and the Pine Tree Parachute promise to become classics. .. Fish anywhere but on the Yellowstone River. The Lehardy Fire is still not controlled and you can't get there anyway. To follow the details visit InciWeb. 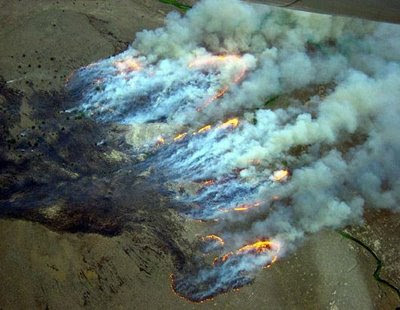 The link to Google Earth will keep you visually updated on this and other fires. .. 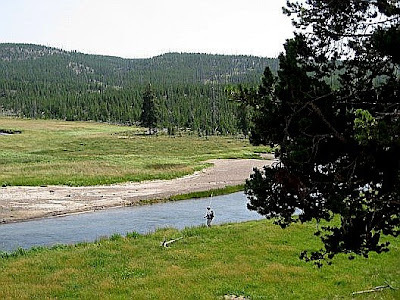 It's time to call it quits if you're into catching fish on the Firehole River. Give it a rest. Temperatures are up, the fish are being stressed in mid day, and there are better opportunities for catching. If you absolutely demand the "Firehole Experience" we suggest that you cut the bend, barb, and point off of your hook. Float that dry right to the nose of the fish that's rising. If it comes up -- YOU WIN; on to the next! AND -- the scenery is grand. .. The Gallatin River is the easy place for all day fishing. So, too, is Soda Butte Creek; So, to, is the Lamar River. The fish are just beginning to get finicky, but there is still time between thunderstorms to catch a few. Take a single box of small attractor flies, leave the vest in the rig, and stroll around. .. The riffle and run sections of the Gibbon River are in perfect condition. If you can ignore the traffic noise you'll find success with the same attractor patterns. Any place that there is dark water probably holds a fish. The catching here rewards the soft and slow stalker - no surprise in the thin water of the canyon. .. PMD's. PMD's. PMD's. Where? Slough Creek. Fish first; breakfast later -- make it lunch. Tell some stories, then, back to the fray with a few ants, midges, and nymphs. Each day that goes by educates the fish a bit more, and given the pressure it's now or more difficult. . . .
.. HDW MOBILE reminds us that all is not what we might think it is. Back from traveling he lets us see what Wordie finds in his 'word cloud.' We tried it. "Creek Fishing for Yellowstone Trout." .. As of 1:00 AM the fire is 0% contained and burning over 700 acres. .. 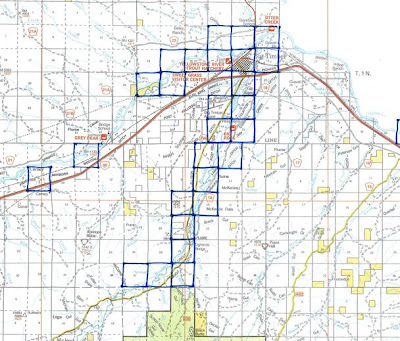 Via NewWest --> "State-owned land in and around Gallatin County could [be] up for oil and gas development — parcels that include the riverbeds of the Yellowstone and Boulder rivers". .. Montana is considering the sale of School Trust State Lands for oil and gas leasing. The NewWest Article spills the beans. The map below shows the parcels. 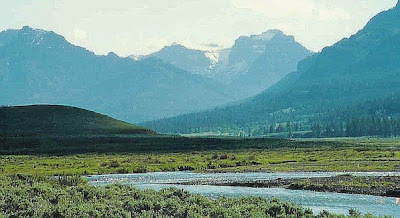 .. As noted by the Greater Yellowstone Coalition much of the land surrounding the rivers is privately owned. HOWEVER, the riverbed is owned by the people of the state of Montana. .. This comes rapidly on the heels of the Ruby River access tussle. Before you know it we'll not only have bass in the Firehole River, but jacks and redfish in the Yellowstone River. The fishing opportunities are endless. Think of the new revenue from heavy rods and 100# Stren. The mind boggles. .. It happens about this time every year. Our home waters fill up with visitors and 'discovery' is the theme for every one of them. 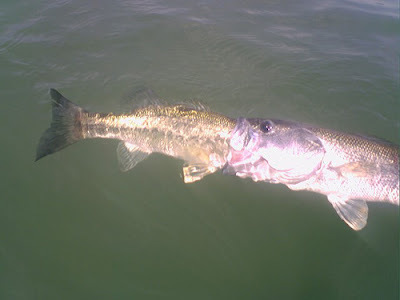 We retreat to better fishing in more secluded areas where the fish are eager, relaxed, and very willing dance partners. There are no secrets about the fishing in Yellowstone National Park. Happily, this time of year, people continue to visit the fabled glory waters and leave the good fishing alone. .. The bits of dust on the Obsidian Creek trail are becoming clouds as more and more people wend their way along this stream. Interestingly, the trails along Straight Creek and Winter Creek are still a bit obscure. The late spring and cool Summer temperatures, (so far,) have delayed one of the sorta secret hatches in Yellowstone. It'll be over by the end of next week, but right now there is excellent dry fly fishing to explosive Brook Trout. Your favorite Green Drake imitation in sizes 16-20 will keep you busy for as long as you care to cast. Watch for the bigger fish to be close to the dead fall and snags. Take your 3-weight and enjoy the scenery. .. Digestion of your leisurely picnic at Grizzly Lake will not be aided by the eager Brookies in the lake smacking anything on the surface. If the day is calm it's fun to cast to the cruisers. If it's windy get to the windward shore for big fish on foam ants. .. The grasshopper nymphs along Blacktail Deer Creek will have wings by next week and the hatch will blossom along with the beetles by the second week in August. This is one of the places where angry Mountain Whitefish will keep you guessing longer than usual. Little scorn should be wasted on these tigers, they are almost as selective as the Brook Trout. .. If you still have legs that still work well, now is the time to fish Cache Creek. It's clear, cold and nearly devoid of fisher folks. .. Eager native Cutthroat Trout have been enjoying the summer so far, (judging by the trail.) The area around Waab Springs shows some usage but this bit of mosquito fodder is well worth fishing right now. The ants are out and they are feeding on first stage grasshopper larvae. Get there early as the temperature really accelerates this hopper hatch. .. Tower Creek is enjoying a resurgence in popularity this year, as is Solfaterra Creek and Indian Creek. The campgrounds are sprouting more fly rods than camper trailers -- for a change. These are still good August destinations, but the upper Fan Creek meadows are probably better for solitude. Of course bears like solitude too. .. These are the sorta secret places that we used to visit this time of year. They are getting crowded as 'discovery' continues. 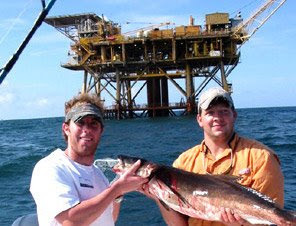 .. We have a couple of places that we've been fishing that are less discovered. The fish are eager, the trails almost indecipherable, the mosquitoes absent, and the water is still cold and clear. Ants abound and the hoppers are over 1/2 inch long. We'll be surprised to see you there. .. We've added one more map. It's not on the map page yet but you can follow along at Yellowstoner's Places. The map is going to be confusing at first because the stream courses coupled with the State/Federal boundaries mean that you will need at least three tickets in your pocket -- Idaho, Wyoming, Yellowstone. .. There are now 13 maps that have been visited over 150,000 times in just over a year. The information base is growing and the visitation rate is gratifying. .. Forget the Firehole River. 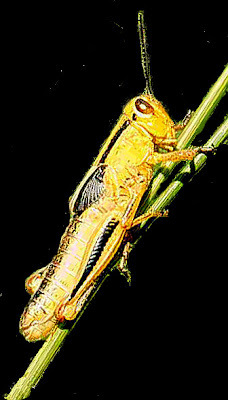 The Madison River is Hot, (the hoppers are just 1/4 inch long, flightless and into their second molt.) The Gallatin River has gone crazy. Grebe Lake is high cold and crowded. .. We haven't caught ours yet, but the Grayling catch on the upper Gibbon River is higher this year than in recent memory. Even the meadows below the falls are continuing to fish and catch well. .. The footpaths along Obsidian Creek are dusty and the elbow density is definitely up. The Gardiner River has come into it's own and the busy roadside sections are pocked with visitors - must be the hoppers. .. Slough Creek has picked up and visitors know it. Pebble Creek is the sleeper. Soda Butte Creek is better than ever. The Lamar River is just slightly colored. Even the Yellowstone River is yielding to the persistent fish hunters, (just stroll along the bank and cast to a rising fish - the fish density is way down but the sizes are approaching enormous.) Summer is late and all is right with the world. .. Recluse fishers have abandoned Duck Creek for the Gallatin River and the willow meadows of Fan Creek. Where is there to be found a bit of solitude? - - nowhere! .. The phenomenal density of mosquitoes in the Cascade Corner of Yellowstone National Park is justly famous and is on time this year. Interestingly, Boundary Creek, Bechler River, and Falls River are yielding gobs of fish to eager anglers with head nets and gallons of DEET. .. The roadside stretch of the Lewis River, the Snake River, and the 'hidden tirbs' are enjoying immense popularity. And, the little bit of water between Shoshone Lake and Lewis Lake is full of canoes and float tubes. We wonder why? .. This is what has made Yellowstone National Park such an exciting place to fish. Right now, (this very instant,) you can fish most anywhere and take home stories to fill a lifetime. The diversity is enormous. The catching success is gratifying. .. You can check the fly shop reports, blog about it, or go fishing . . . we're doing the latter. .. Jeff Kennedy over at Drawing Flies is back at it. We won't spoil the joy, but it's worth a daily click. We want to see just what he gathered up on his Yellowstone adventure. Will Yellowstone Be Next ?? 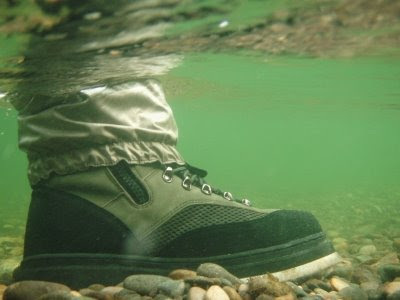 .. New Zealand has banned felt-soled wading boots. 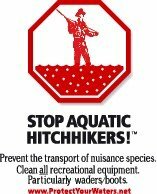 This is an effort to help stop the spread of invasive species. This is important. We wonder when Wader Makers and governments in the United States will follow suit? .. Read it HERE, from Protect Your Waters. 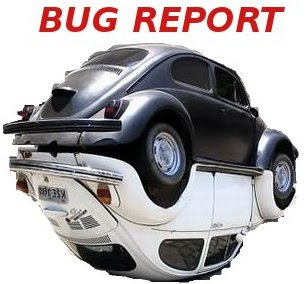 (The image files for this post are huge. .. 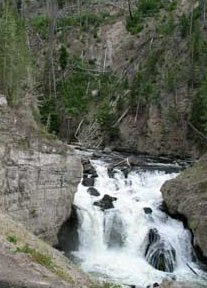 Most visitors to Yellowstone National Park appreciate the Firehole River for it's beauty, thermal features, swimming hole, broad flowered meadows, and roadside picnic areas. This is a good time for fly fishers to do the same. .. 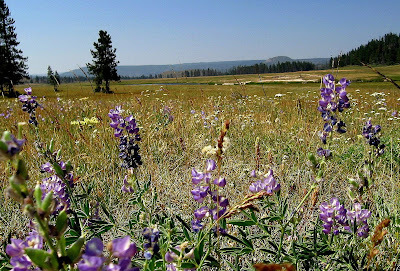 If fishing the Firehole River is on your agenda during the next 30 days, take time during mid day to pause and smell the flowers - so to speak. .. Do as the local residents do: pay homage to Mattie Culver and drop some flowers at her head stone. She was the wife of a winter keeper and died in the winter of 1889. .. She was left unburied until the ground thawed. The web will give you more information about this hearty Yellowstone pioneer. Her grave is located on the peninsula between the Firehole River and Nez Perce Creek. .. The beautiful pool and stream-wide riffles nearby are named in her honor. The fish are visible in the warm water during mid day. They cruise lethargically from the depths to the shore. Throw them no hooks. 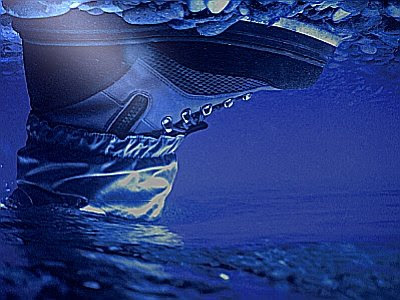 Watch and plan for when the water is cooler. .. Our prolonged Spring has kept the flowers blooming. Stroll around before and after your picnic and enjoy them. .. 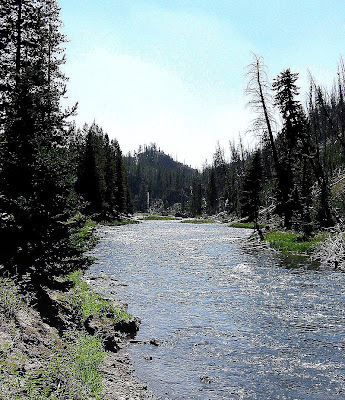 There are places to fish on the Firehole River all season long. Now is the time to explore them. 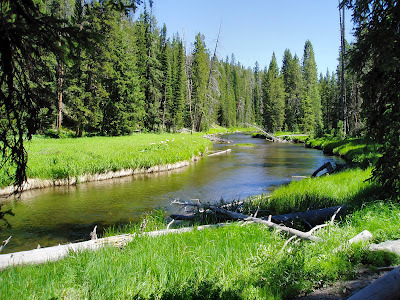 There are still cold waters and some good fishing on the Little Firehole River in Biscuit Basin. 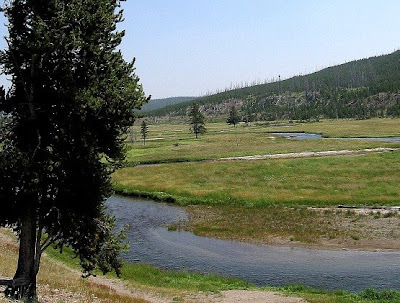 The confluence meadow and the shade of the trees up the Little Firehole River are excellent places. There is even a bridge for traversing the spongy areas. .. Many of the larger fish have already migrated into this refuge. It's a poorly held secret for Summer fishing and catching. .. Maybe you'll even try Iron Spring Creek; just don't wander into the thermal area. .. Take the time to walk to the cool water where the fish are in better shape and the catching won't exhaust them to the point of mortality. .. There is exceptional all season fishing on the Firehole River above Old Faithful. The broad easy bike trail to Lone Star Geyser Basin provides excellent access to this cold water portion of the Firehole River. There is a bridge up here too. There are mostly Brook Trout in this section, and they are willing dance partners. Give them a twirl and you should have the time of your life. .. You can stroll from pool to pool, riffle to riffle, run to run, and cover the whole trail and back without breaking a sweat. There is a hidden and secret beaver pond up this way too. It will remind you of times gone bye. We'll not tell you where. .. The Brook Trout in the pond are a bit more shy than those in the river - must be a characteristic of age and size. .. There is even exceptional fishing in the lower part of the river's reach. Dancing water, placid pools, glides and streams that are ignored by most fishers this time of the year. .. There are berries, (just starting to ripen,) shady runs, green grass, downed snags, deep pools, and everything that quickens the heart of a fly fisher. .. It is vacant and the trout are busily eating and enjoying their Yellowstone vacation. Should you desire to interrupt their contented existence it takes just a little scramble down a steep bank. Where is it? Just below the lower cascade of the Firehole Falls Complex. Don't tell anyone you heard it here. .. It's time to let the Firehole River rest. Let the fish struggle through the warm water period without the aggravation of persistent fly fishers. It's time to visit The Other Firehole. .. 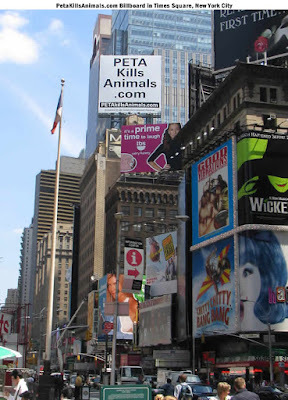 The PETA trial in North Carolina has brought to light some interesting tid-bits about how a $30,000,000.00 organization treats animals in its care. This is becoming quite the interesting event. READ IT HERE. MORE HERE. .. The recent expansion of the fly fishing sections at Wikepedia continues. Recent additions to Angling In Yellowstone National Park, and Fly Fishing have begun to shape the whole section and topic. When this flurry of activity is over the die will be cast for the scope and content of the subject. .. Wikipedia has grown to enormous proportions and is becoming a "go-to" source for both casual and serious research. It's still a bit cumbersome too, but it is a useful early tool in research and general information gathering. .. The Wiki-Spawn are proliferating and now include Wikiversity, wikiHow, Wikihowto. Cross references and cross fertilization is beginning to be fully incorporated in the various articles on many topics and subjects. .. There is currently no entry for fly fishing in Wikiversity, wikiHow has dozens of fishing related articles including how to fish for river trout and how to tie a blood knot, Wikihowto has no articles on fly fishing. .. Here's how you can help. The Fly Fishing article in Wikipedia has an editorial box, (masthead image,) noting the specificity of some aspects of the article, along with a caution that technique and methods might be better suited to other wikis. .. Jump right in and add your two cents worth. If you don't, your expertise and information may be lost to the ages, (we notice that the East Gallatin River entry is particularly sparse.) Or just ignore it all and go fishing. .. Now is the time to tie up some 'Hopper-Dropper' leaders. The hoppers are going to be here very soon and the action promises to be violent this season. .. There are a few hoppers at the little riffle above the picnic area in [no] Elk Park on the Gibbon River. 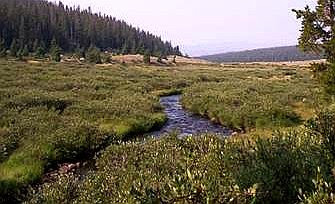 There are a few in the meanders at National Park Meadows on the Madison and Gibbon Rivers. None have been seen at Grasshopper Bank - but then, again, we didn't stop to look. .. We have a trusted report that there are hoppers at Roosevelt, and that the elk on the flats south of Gardiner have been seen kicking at mysterious yellow dots. .. Take your fluttering caddis for a walk on the Firehole River after dinner. Stay until dark-thirty and fish the back eddies and undercut banks. Keep the 'skeeters away with an occasional respite and your favorite bug repellent. .. There is still very good fishing on Nez Perce Creek. Don't tell anyone that you heard about it here. Simple attractors and a few soft hackles will be all you need. We fished there all day and into the night with just Feather Dusters and Stiff Hackles, (floated and sunk both of them and they worked just fine.) Caught a fish or two. Saw a bear. Saw a bison. Saw two day hikers. Visited with a blood sucking mosquito. .. All bugs present and accounted for on the Gallatin River. All fish eating well. No hopper reports here yet, but that doesn't mean you can't practice with them. PMD's, Golden Stone Flies, and a glorious evening caddis hatch adorn this river. .. Somehow the word has spread and the parking places are scarce. Try a Casual Dress, Yellowstone Sally, or Hellifiknow in sizes 12 and smaller. You can float or sink them to your heart's desire. .. Soda Butte Creek is ripe. Morning will be the finest time if you dislike mosquitoes. Fish the little riffles and pocket water in the small canyon just above the confluence meadows. Nymphs, to start with, is the way to go; followed by your favorite PMD or Gray Drake imitations. Floating a sparsely dressed soft hackle can do it all. .. Evning will bring on the caddis and a trip down the road to Slough Creek can produce some amazing results with just about any well presented imitation. 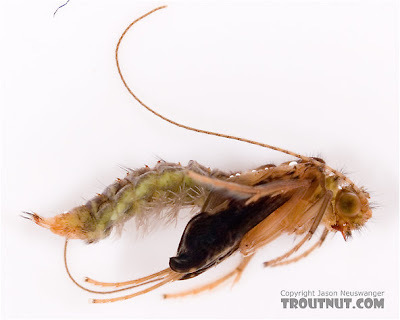 .. An excellent pattern for almost the whole caddis hatch is the Iris Caddis. This pattern originated right here in West Yellowstone. It is a development of the folks at Blue Ribbon Flies and is usually fished as a floater. It is just as effective when drowned. The original can be seen HERE. A modern version can be seen HERE. Tie a bunch of these and use them behind a floating hopper and you may get tired of catching. 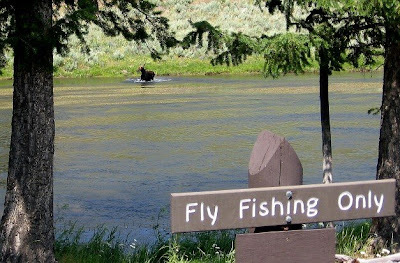 .. Those busy beavers over at Parks Fly Shop have published a useful article entitled A Month By Month Rundown Of The Fishing In Yellowstone Country. This brings their information articles to four. We look forward to the coming chapters. .. The Recreational Boating and Fishing Foundation (RBFF) has updated and expanded their site. This foundation is funded through a cooperative agreement with the U.S. Fish and Wildlife Service. It has excellent introductory articles for family fishing and boating fun. The fishing information is generalized enough for the novice and specific enough for the advanced angler. Regional and state information is excellent, and very useful if you travel to an unfamiliar region of the country. Check out the Fishing Section, and the State Information. There's even some statewide fishing reports that are references to commercial sites and are sort of timely and mostly accurate. .. Fly Fishing Yellowstone Park continues to grow and expand. The recently added stream directory and the Yellowstone Hatches sidebar are very useful introductory tools. We anticipate additional hatch charts, too. .. We would be remiss in our late night typing should we fail to mention the beautiful sheepshead fish pictured over at the Horse's Mouth. Such wondrous form and proportions are seldom seen in this part of the world. It must be the salt water that enhances such striking beauty.
" I'd Still Rather Be Fishin' "
.. Anne Medley of NewWest.net spent a day collecting this video, an interview, and dead animals. Read the whole story HERE. Just How Warm Is Too Warm ? 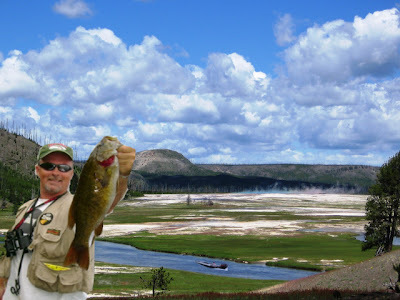 Will Bass Invade Yellowstone ? .. A note by Cory Hatch in the Jackson Hole Daily cites studies that suggest our grandchildren may be seeking bass instead of trout in Yellowstone's Firehole River. 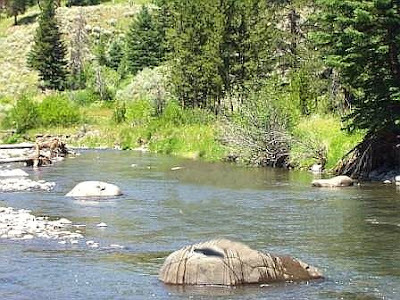 Water temperatures in Wyoming trout fisheries have already increased 2 degrees, a trend that could reduce fishing opportunities in the state by 50 percent by the end of the century, a report by conservation groups says. 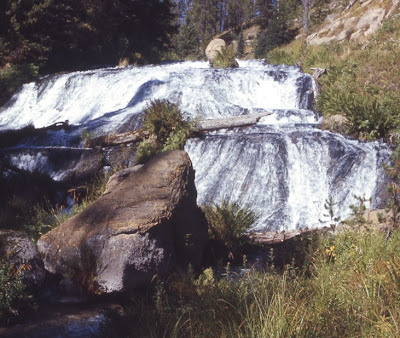 Wyoming rivers such as the Firehole, the North Platt and the Upper Green are considered most at risk in the state, according to the Natural Resources Defense Council and Trout Unlimited.